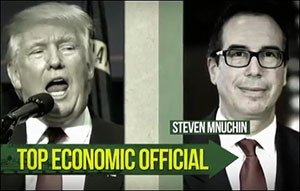 Over the span of the last two weeks, President-elect Donald Trump’s U.S. Treasury Secretary nominee, Steven Mnuchin, has been the subject of multiple, scathing investigative reports by the media; earned a web site established by Senate Democrats dubbing him the “Foreclosure King” and soliciting complaints from the public; garnered a television ad campaign directed against him; and has been skewered by a devastating document leaked by someone currently or formerly connected to the California State Attorney General’s Office, indicating that the bank Mnuchin ran from 2009 to 2015, OneWest, repeatedly violated California foreclosure law, including backdating documents and making illegal bids, in order to throw thousands of vulnerable people out of their homes. Mnuchin is also a former Goldman Sachs partner and hedge fund operator who has never held public office before. His rapid rise to nominee for one of the highest posts in the U.S. government, which will also put him atop the Financial Stability Oversight Council (F-SOC), appears to be hinged to raising millions of dollars for Trump’s political campaign as his National Finance Chairman. To millions of Americans, this looks like an unseemly political quid pro quo. “Lew also cashed in his chips at Citigroup, taking a job there from 2006 through early 2009 that paid him millions, including a $940,000 bonus in early 2009 that was paid with bailout funds from the U.S. taxpayer after the company became insolvent from soured mortgage bets. Lew served as Chief Operating Officer of the very division that the SEC charged with hiding $39 billion of subprime debt off its balance sheet in Structured Investment Vehicles (SIVs). “But that bonus was hardly the end of Lew’s problems. He invested in a fund in the Cayman Islands at the very street address that the President had called a tax scam. [While working at New York University, Lew received] a $1.4 million loan from endowment funds at New York University, a taxpayer subsidized nonprofit, to buy a lavish home in the Riverdale section of the Bronx; he accepted forgiveness of large amounts of the loan and a reimbursement of the interest charged on the loan from the University. “After negotiating a lush pay package to move to Citigroup, he somehow got a $685,000 ‘severance’ payment from NYU. And, worst of all, when repeatedly asked in writing to explain the details of these transactions, he stonewalled the Senate Finance Committee. I’m not taking the word of Republican Senators on this; I did my own investigation and Lew was a master of intentional obfuscation, leading to the obvious question, what else is he hiding. “…Mr. President, the next Treasury secretary will face enormous challenges. Let me give you a few examples of what I mean. The next Treasury Secretary will play a central role in regulating and overseeing Wall Street and large financial firms. Let us never forget: as a result of the greed, recklessness, and illegal behavior on Wall Street, millions of Americans lost their jobs, homes, life savings, and ability to send their kids to college. “Mr. President, the next Treasury secretary will face enormous challenges to get this economy back on track, to reform Wall Street, to shrink our growing trade deficit, to reduce the enormous income and wealth inequality in this country, and to put millions of Americans back to work. Lew was confirmed by the Senate with a 71-26 vote in his favor. This is the state of American politics today: the disgraceful men of Wall Street are elevated to the highest offices in government to tailor and dictate policy to the peasants, regardless of which political party controls the White House.